Earlier, you heard my wonderful story about playing as Twitch and doing really well and then losing the game. Well, not this time! This game I got big. Don’t take that out of context, I was a monster. Last time I was 4.8k gold ahead of second place. This time I was a whopping 6.8k ahead of second place on my team and 7.3k gold ahead of anyone on the enemy team. I was a League of Legends R.O.U.S.! But it gets better. We had two double kills in bot lane, but not us killing them, but the enemy getting double kills on us. This is a sad thing. The first time we had both of the enemy champs down to one hit. It was really sad to think that I had used Ignite on Lulu, only to see her walk away without any damage ticking on her. Sadness. The second double kill for them was an Amumu gank. It was really bad for us, really great for them. We weren’t even close. 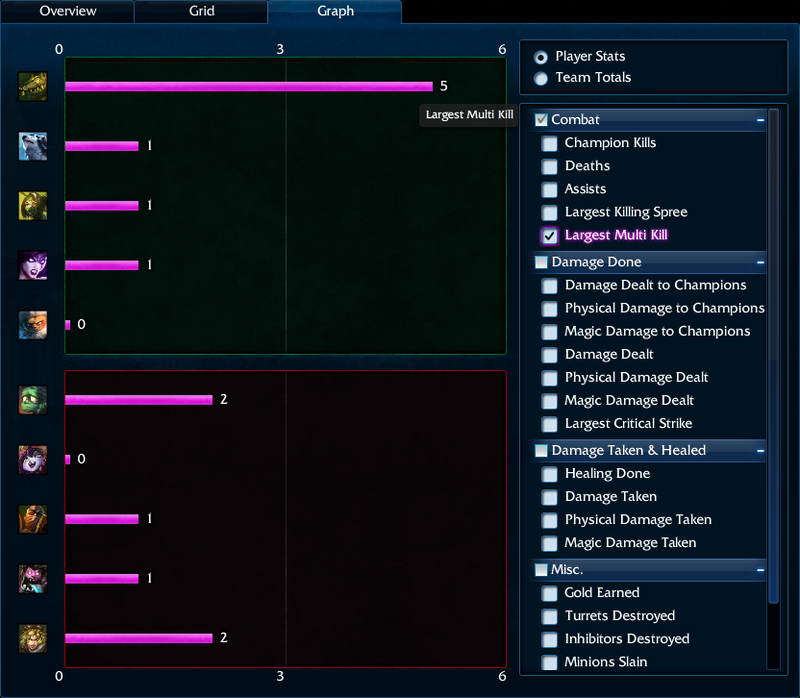 However, we had a trusty late-game comp of Twitch, Nunu, and Morgana. Morgana locks them down with an ult and gives me a spell shield. Nunu uses Blood Boil on me and slows the enemy team with his ultimate. Twitch does some crazy damage. Despite losing bot lane (I think it’s fair to say that) I was ahead by more than 30 CS in the laning phase. I was behind, but I was not behind, especially with a Blood Boil. Now the most humorous part of this game was Steve’s champion pick. He picked up Akali. Why? To take my CS and my kills. Period. For real! He told us on Skype and we just laughed about it. After hundreds of games as Ezreal, Corki, and Tristana, I get only my second Penta kill as an ADC and it’s with the ADC I probably have the least amount of experience with. Oh, the irony! I was so ecstatic in the moment that all I could do was laugh. I went to push and actually held TAB to see who was up on the enemy team. We ended up tanking towers to get to their inhib. That wasn’t the end of the game, but it didn’t get much prettier. 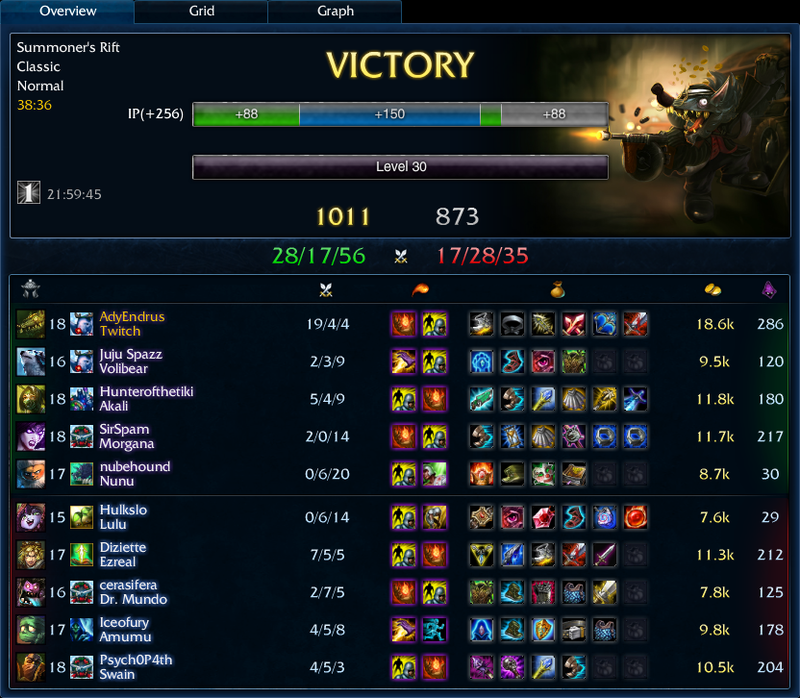 I caught Amumu walking out to protect their tier two turret in top lane so I just started auto attacking him. He used Flash to get away from me, so I hit E, and he didn’t die. Well, not right then. He let the poison tick down on him and finish him off. I heard Jack say, “Oh, that’s just the worst, when you get away but still die. Poor Amumu.” Then something about hating Amumu. The Scimitar saved my bacon so hard after I got caught later in the game. I didn’t have it yet, but if I would have gotten another chance to go back and buy it would have been my next purchase guaranteed. Mummy ult was just too deadly. If I got caught in it when I didn’t have assistance from Morgana then I was one sad rodent. I can still hear it now… PENTA KILL!